It can be hard to explain to friends and family why we quilt. Why do we spend so much time, effort, and pain (not to mention money!) at the sewing machine? 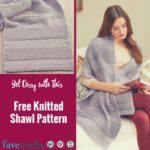 Besides an easy baby blanket or a memory quilt, what exactly is to be gotten from so many hours of stitching and cutting and folding and measuring? Well, it’s hard to put a finger on it, exactly. Many of us make simple quilt patterns because we love to create; others because quilting is a hobby and a gift passed down from generation to generation. Either way, we love quilting for much more than just the finished product! 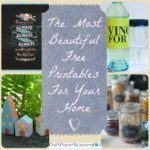 We love our quilt guilds, quilt fairs, message boards, quilt blogs, charity quilts, and of course the story that comes with the process of making every quilt, even the simple quilt patterns that we could sew in our sleep. Every quilt has a story. Speaking of stories, maybe the best way to explain to others isn’t to tell them about the minutiae of quilting or explain how to cut half-square triangles, but to show them a story about how quilting can touch the life of the quilter. So, with no further ado, FaveQuilts presents: our top 5 quilt novels, available on Amazon! As her daughter’s wedding day approaches, Sarah McClure reflects upon Elm Creek brides past and present—the traditions they honored, the legacies they bequeathed, the wedding quilts that contain their stories in every stitch. 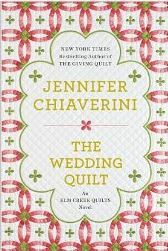 Unexpectedly, Caroline confides, “I wish I had a wedding quilt, one I made myself.” Even the most talented novice would be daunted by the task of stitching, mere days before the wedding, a worthy symbol of the couple’s bonds of love, commitment, trust, and hope for the future. 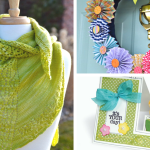 Turning to her cherished friends, the Elm Creek Quilters, Sarah asks them to pool their creative gifts. 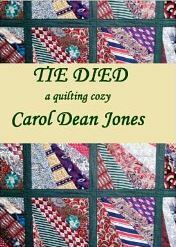 As the women stitch, their memories render a vivid pastiche of family, friendship, and love in all its varieties. 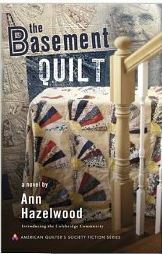 In The Basement Quilt, a novel by Ann Hazelwood, you’ll get to know the family and friends of Anne Brown, a plucky florist whose daily ups and downs will seem so familiar—you’ll identify with her right away. 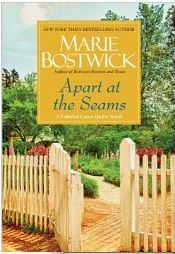 Anne decides to learn to quilt to help her aunt, and in the process learns family secrets. Then she uncovers a mysterious presence in her mother’s basement—or does she? Anne learns about love, too, in various forms. She and the members of the Colebridge community go through some big life changes. Are their decisions wise or does trouble lie ahead? Twice in her life, college counselor Gayla Oliver fell in love at first sight. The first time was with Brian–a lean, longhaired, British bass player. Marriage followed quickly, then twins, and gradually their bohemian lifestyle gave way to busy careers in New York. Gayla’s second love affair is with New Bern, Connecticut. Like Brian, the laid back town is charming without trying too hard. It’s the ideal place to buy a second home and reignite the spark in their twenty-six year marriage. Not that Gayla is worried. At least, not until she finds a discarded memo in which Brian admits to a past affair and suggests an amicable divorce. Devastated, Gayla flees to New Bern. Though Brian insists he’s since recommitted to his family, Gayla’s feelings of betrayal may go too deep for forgiveness. Besides, her solo sabbatical is a chance to explore the creative impulses she sidelined long ago–quilting, gardening, and striking up new friendships with the women of the Cobbled Court circle–particularly Ivy, a single mother confronting fresh starts and past hurts of her own. 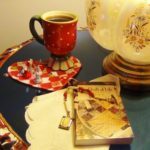 With all of their support, Gayla just might find the courage to look ahead, decide which fragments of her old life she wants to keep, which are beyond repair–and how to knot the fraying ends until a bold new design reveals itself. . .
Sixty-seven year old Sarah Miller sat among her unpacked boxes reliving the loss of her husband, her young grandson, and now the place that had been home for forty two years. Everything she unpacked carried a memory, some warm and some painful. But, Sarah is a survivor. As she reaches out into the retirement community that is to become ‘home’, she finds friends, activities, new hobbies, and possibly a love interest. When one of her new friends is murdered, she and her feisty friend, Sophie, are determined to find the killer. 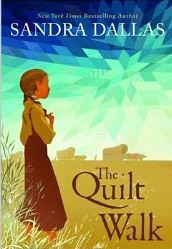 It’s 1863 and 10-year-old Emmy Blue Hatchett has been told by her father that soon their family will leave their farm, family, and friends in Illinois, and travel west to a new home in Colorado. It’s difficult leaving family and friends behind. They might not see one another ever again. When Emmy’s grandmother comes to say goodbye, she gives Emmy a special gift to keep her occupied on the trip. The journey by wagon train is long and full of hardships. But the Hatchetts persevere and reach their destination in Colorado, ready to start their new life. Follow Emmy’s journey of family, love, and adventure. 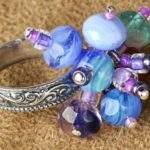 Have you heard about our current giveaway? 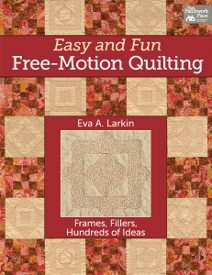 It’s a copy of Easy and Fun Free-Motion Quilting by Eva Larkin! Free motion quilting is one of the most common techniques quilters used to add detailing to their patterns. If you’re in need of some beautiful patterns or want to begin learning how to incorporate free motion quilting into your patterns, read Easy and Fun Free-Motion Quilting. This book takes a different approach to machine quilting, and instead of simply giving you quilting designs, focuses on frames and fillers that encourage quilters to think about how they add their swirls and lines in a new way. 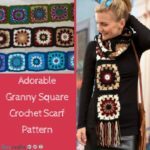 Don’t miss this book of awesome patterns and tutorials to have you free-motion quilting like a pro! Read the full review and then head over to our giveaway page to enter for your chance to win! 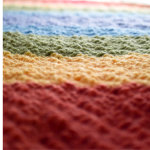 Do you have any favorite quilting stories or memories? Share them below! It’s time for kids to begin their summer reading! 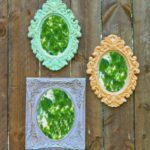 If your kids don’t like to sit down and read, introduce hands-on experiential learning through Summer Reading and Crafting from AllFreeKidsCrafts.com. The kids crafts and art projects below will help children understand important themes in the story. 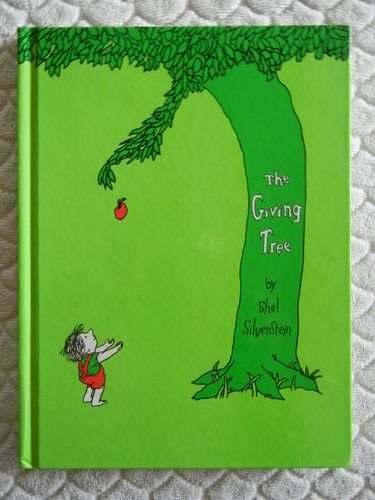 See last week’s post about The Giving Tree here. 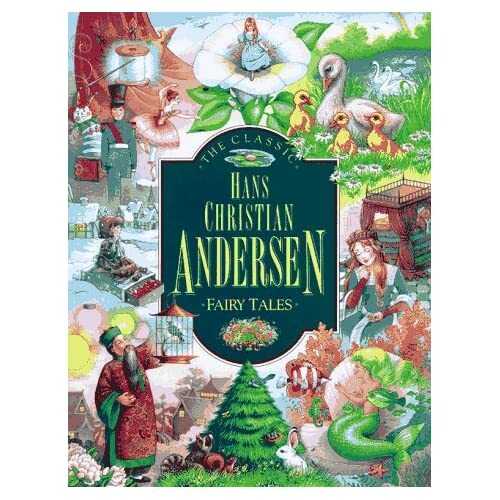 Hans Christian Andersen was an author and poet who remains famous today for writing children’s stories like “The Ugly Duckling,” “The Emperor’s New Clothes,” and “Thumbelina.” These tales, written in the 1830s and 1840s, tell stories about fantasy, courtly life, animals and morality. Since their publication, Andersen’s stories have become cultural icons, inspiring countless books, films, and television shows. Most of Andersen’s stories are simple enough for young children to enjoy, while older kids can learn about the customs of the time and study the message behind each tale. 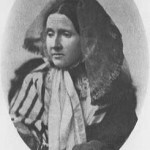 Andersen was criticized because some of his stories lacked a specific moral, but the stories often feature familiar situations that children face in their daily lives. Reading a number of them will provide children with a series of messages, advice and lessons for growing up. 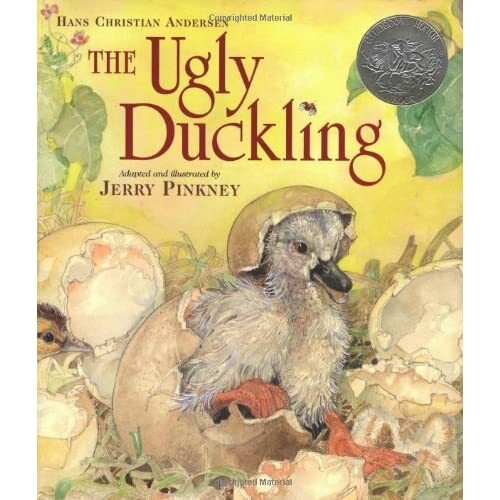 “The Ugly Duckling” deals with bullying and can help children cope when they are being teased at school. It also indicates that good things may come of a little patience. 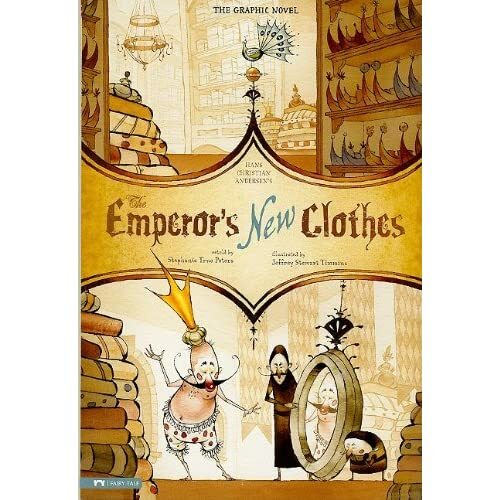 “The Emperor’s New Clothes” teaches children to think for themselves and to resist peer pressure. 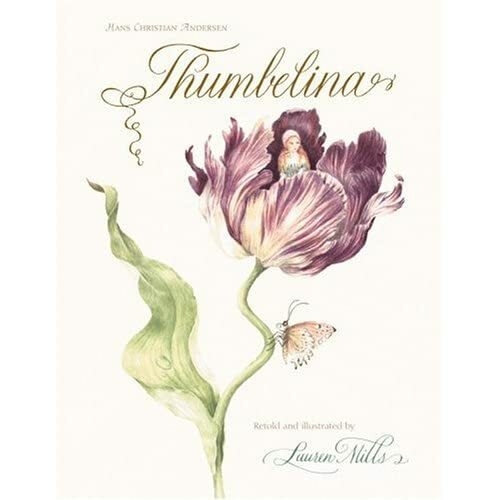 “Thumbelina” is an excellent story for children because it features a strong, adventurous little girl in a big world who faces the elements and decides her own fate. The story can teach children how to make their own decisions as they mature and become more independent. Kids can use walnuts to create some adorable ducklings and swanlings (also known as cygnets) just like the Ugly Duckling. Remind the kids that they are beautiful no matter what the bullies might say and make these Walnut Shell Ducklings. When reading “Thumbelina,” kids can get outside and find the magic in nature by making Twig and Toadstool’s Woodland Fairy Folk between tales. Kids can even make a little Thumbelina out of a pine cone. What are your favorite fairy tales? I like the ones by the Grimm brothers as well!